Joseph Pilates' small private studio in NYC. Over 80 years ago, Joseph Hubert Pilates had a vision of well-being for all people based on his years spent rehabilitating wounded soldiers in World War I England, furthered by his later work with professional dancers like Martha Graham and George Balanchine in New York City. Built on these experiences, and rooted in the theories of Friedrich von Schiller and others, Joe Pilates envisioned the use of the incredible power of the human mind to mold the body from the inside out. Pilates went on to build a system of exercises that all share a common requirement: complete mental focus on the individual muscles being exercised at that moment. Concurrently, Pilates realized an anatomical truth: that the overall fitness of the human body emanates from the inside out: that the deepest muscles (what we call the “Core” muscles) must be isolated and developed in series, as all other body systems depend on the Core for balance, stability and strength to function optimally. 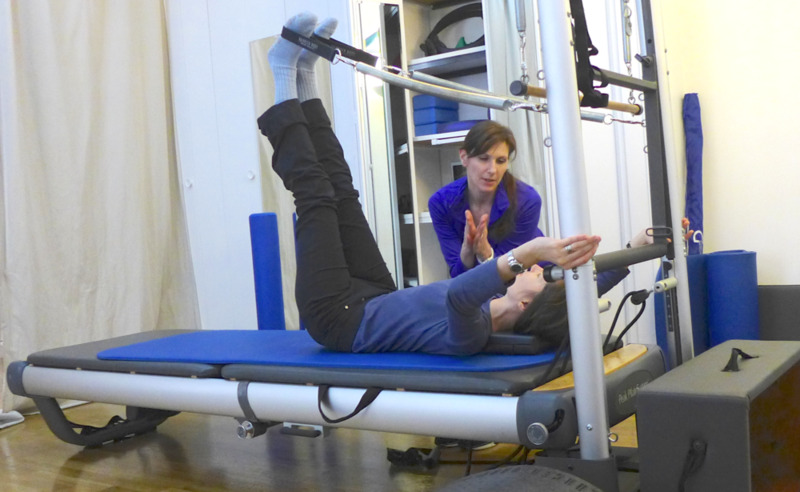 This combined state of brain-muscle awareness and internal-external equilibrium, called “the Mind-Body Connection”, is the basis of all true Pilates work, regardless of its current source. Pilates exercises are not designed to leave you tired, winded and sore. In fact, the opposite is true. By allowing movements to stretch your muscles as you simultaneously work on strengthening them, you are creating a habit of relaxed effort, creating muscle-memory maps for your body to follow. You'll discover a newfound ease in executing even routine daily tasks. Structured around the deep core muscles of your body or "powerhouse" (i.e. thorax, hips, back and buttocks), the exercises of the Pilates Method are instrumental in creating and maintaining good posture, balance and alignment. Joe Pilates circa age 78! Because you stretch your muscles as you strengthen them, you are extending flexibility, increasing control, and heightening awareness of length and range of movement. The result is a super-strong abdominal center, long & lean muscle, supple spine and a refined sense of movement and ease. Joseph Pilates, despite living a long healthy life of 87 years, didn’t live to see what has become of his vision, but we believe he would not agree with a lot of what has transpired in recent years. Pilates like many exercise regimens before it, has become highly commercialized: that is it has been expanded from Joe’s focus on individual or small group sessions and expanded (often by large corporations making profits from volume equipment sales) into noisy, chaotic and overpopulated classes with too many students and only one instructor - quite remarkably, sometimes none! Or what is often people’s current Pilates experience: a room crammed with instructors shouting over each other to be heard and their distracted clients. A typical crowded Pilates studio. Never private, and hardly focused on you alone. Hardly the way to generate the keen mental focus and attention to controlled body movements that Joe Pilates demanded in his small studio in 1940s New York City! At Pilates Privé studios, our focus is on individual private instruction. Although we agree that bringing more people to Pilates is a general positive, large classes are too often a poor introduction to a complex exercise regime. Indeed, over the last eleven years we have seen that if our clients wish to achieve the real physical & mental benefits that Joseph Pilates envisioned for them, they also must learn Pilates the way he taught it: with singular focus in a private environment being taught by a dedicated, highly trained and passionate instructor. Undivided attention from your instructor and complete focus on your exercise makes the difference! Our instructors are highly trained and passionate about helping their students live healthier lives by understanding their bodies and how to improve them.